For me, running is one of the most intimate ways to get to know a city, especially during a marathon. Within three to six hours you get a tour of at least some of the major attractions, without worrying about traffic. You will usually pass through some of the lesser known parts of the city or the suburbs, too. 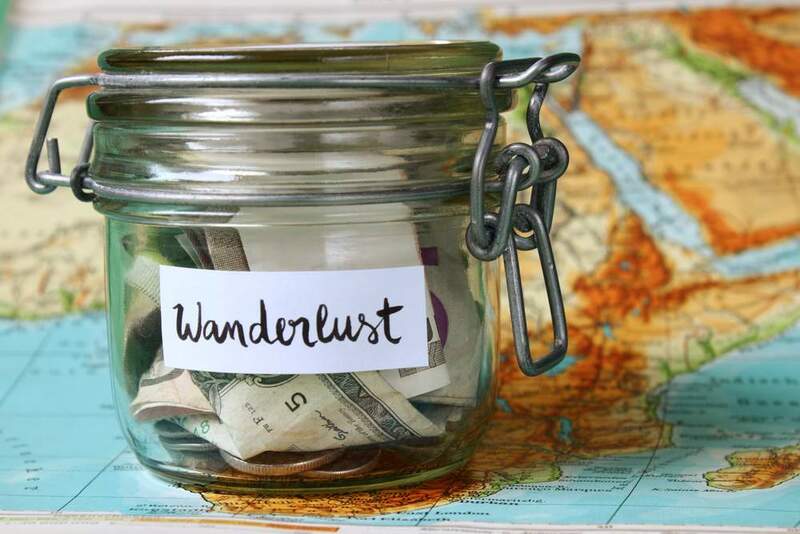 A marathon is a half to full day event, so it’s great for a weekend trip or even as part of a vacation…..assuming you can still walk the next day to do more sightseeing. Don’t get me wrong – I love participating in and supporting local races, but there’s just something different about running a marathon in another city or country. 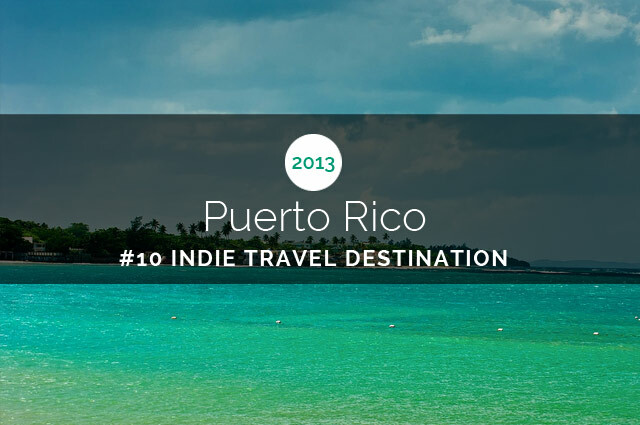 It can be an amazing experience, but you will want to plan ahead of time to avoid any potential problems. 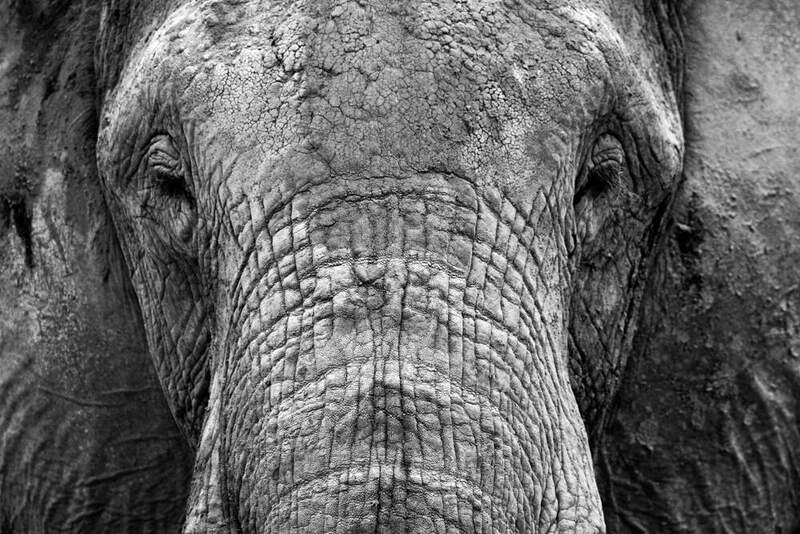 If you are going to another country in which you do not speak the language, consider going with a tour group. Even if you don’t usually travel with a tour group, it can be a totally different experience with a group of runners. Many tour packages take care of everything that has to do with the race (registration, getting you there and back to your hotel, even meals sometimes) and also include a few days of sightseeing around the area. If you’d rather not go with a tour group, talk to a travel agent about signing up for the race, or find a translator who can help you register. Make sure you check, double check, and triple check that you have all of your race day gear, and take it on your carry on. The last thing you need is to have your running shoes or lucky headband lost in transit. Also be sure to print out your registration confirmation and any other information you might possibly need. Depending on where you are going, you might not have access to the internet or to a printer to check these things last minute. Whether you are thinking of running your first marathon or ready to train for your tenth, this list of some of the best races in the world will give you the motivation to go and register. With everything from the best race for inline skating to the best race to catch a glimpse of an elite runner, you are sure to find one that will motivate you to get going. Course: Fast and flat around the city of Berlin and with views of many tourist sights. 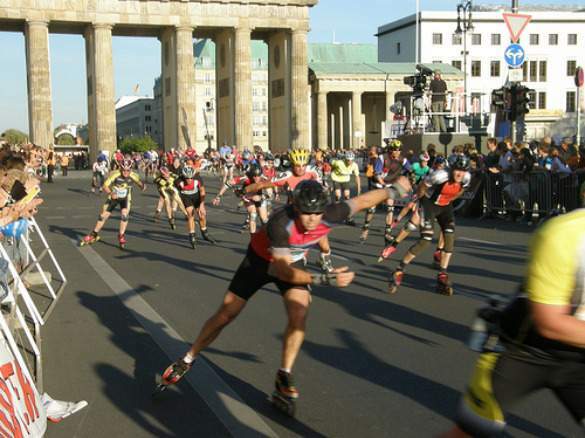 With nearly 8,000 inline skaters, this fast and flat course is a great way to sightsee around the German city. Around 95% of the skaters are amateur, so if you are looking for an opportunity to go the distance in your roller blades, this is it! The course goes through the grand old architecture of the former East Berlin to the more modern West Berlin. It starts and finishes near Pariser Platz, right in the middle of the city. 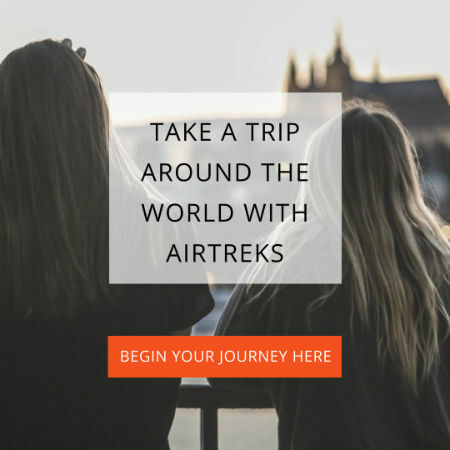 Going on a RTW trip? Why you should add Berlin to your RTW trip itinerary. 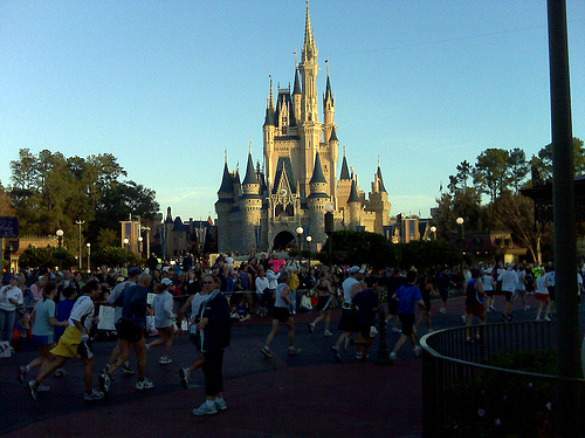 Feel like a kid again at the Florida Walt Disney World marathon with a course that takes runners around the park, through the Princess castle, and around the resorts and the Epcot center. You will be cheered on by Disney characters and Disney entertainment for the true Disney experience. Runners can also get personalized race bibs and a Mickey Mouse finishers medal. Course: A moderately difficult course of rolling hills along the scenic Pacific Coast Highway. 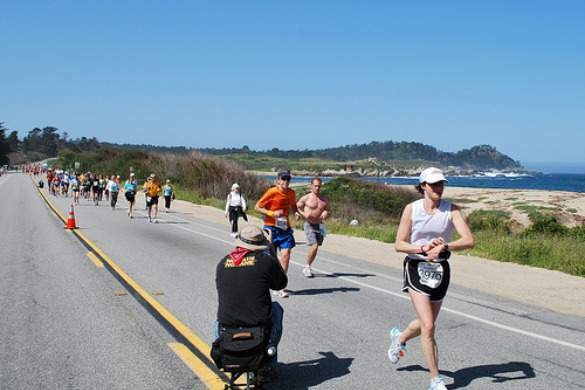 Always on the list of best marathons, the Big Sur marathon is 26 challenging miles, but runners will be rewarded with views of the Pacific Ocean, and getting to run among the giant Redwoods and rural ranches of Northern California. With the race limited to 4,500 runners, just a fraction of the big city races, you can (almost) enjoy the scenery on your own. There are even strawberries at mile 23 and bagpipes at mile 25 – just when you need a pick me up! Registration fee: Entries are through a lottery system, with 3/4 of participants running this race with a fundraising group. Registration fees (usually 30-100 pounds) and fundraising costs vary by group. Course: The course is fairly flat and follows the River Thames, with views of many popular tourist attractions – the Royal Naval Hospital, The London Eye, Big Ben, and Buckingham Palace. 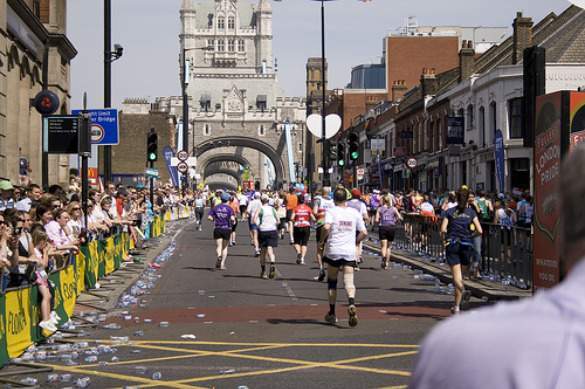 The London marathon is a race that has been soaring in popularity over the past few years, no doubt in part due to the elite runners that frequent this race. The flat course, and overcast and cool fall London weather make it a great race for a personal best. Even if you don’t catch a glimpse of Paula Radcliffe, there are plenty of famous London landmarks along the course to keep you occupied. Course: Starting in the rural town of Marathon, the course begins with rolling hills in Greece’s countryside. Once runners start to approach the city of Athens, it flattens out. This marathon takes runners back to the very roots of the race by running the supposed route that Phidippides himself ran in the legendary tale. At the very least, it’s the same course from the 2004 Olympics (the blue line that the athletes followed is still on the road). Perhaps the best part about this marathon is finishing in the modern Olympic stadium, which is a huge marble structure with views of the Parthenon- if you feel like hiking to the top after your race, that is. If you are unfamiliar with the country and/or registration process, there are several groups that take care of everything for you and include a bit of sightseeing. From my own personal experience, Apostolos Greek Tours is a great choice for foreign travelers and is reasonably priced. The Rock n Roll series is a unique marathon series that is perfect for a beginner marathoner because of the crowd support. 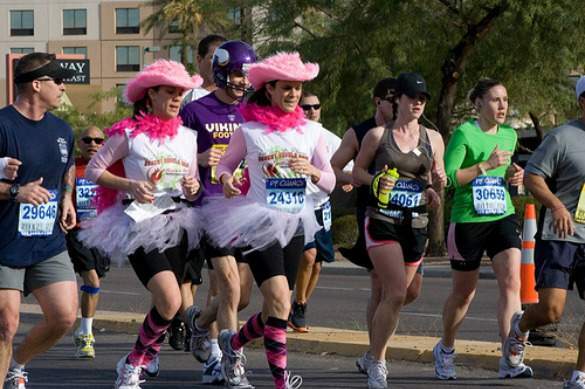 With local bands and cheerleaders performing at every mile, you will rarely be running without someone to cheer you on! There is a special medal available if you complete more than one Rock n Roll race (including half marathons) in one year. Registration fee: $135 for the full marathon/$115 for the half marathon. *Note: The race sells out every year, so the organizers have adopted a random drawing contest, which is usually open for a week in April. If you don’t get in through the drawing, there is always the option of participating with a charity, such as the Leukemia & Lymphoma Society’s Team in Training. 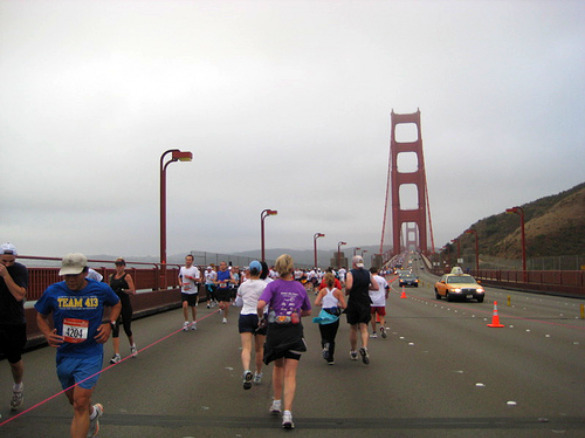 Course: The race course follows the outskirts of San Francisco along the bay, past Fisherman’s Wharf and around Golden Gate Park. While there are no cable car hills, there are a few inclines around miles 7, 10, and 13. Although men can participate, this race is definitely geared towards women with pedicures, massages, a Ghiradelli chocolate aid station, and firemen waiting at the finish line to hand out the finisher’s medals – Tiffany necklaces! Don’t forget to visit the Nike Store in Union Square the day before the race to see your name on the wall of participants.